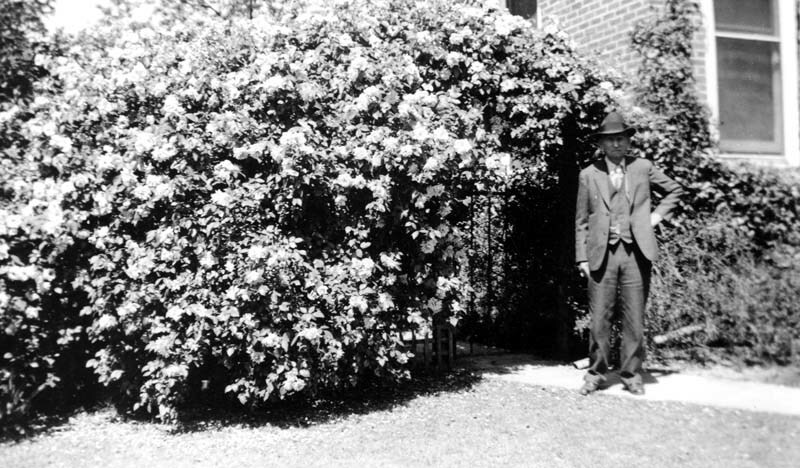 John Zalud by his rose gate at his home on the southwest corner of Hockett Street and Morton Street. His daughter Pearl Zalud later willed the house and it's contents to the City of Porterville. It is now the Zauld House Museum. 1 photograph : b&w ; 10.15 x 5.94 cm. The images presented in these online galleries were selected from the photograph collection of the Local History Room in the Porterville Public Library. For more information about acquiring copies of these images please contact Carolyn Johnson, Porterville Public Library, 41 W. Thurman Ave., Porterville, California 93257; (559) 784-0177. “John Zalud,” San Joaquin Valley Library System Digital Collections, accessed April 18, 2019, http://digital.sjvls.org/document/2807.